Whisk together all ingredients except oil. Slowly drizzle in oil, whisking vigorously to emulsify. I use a hand held immersion blender (love that thing!) and not only does it perfectly emulsify the oil with the other ingredients, it also blends in the shallots so that they are not chunky/crunchy in your dressing. Taste test and add more sugar, salt or pepper to taste. Welcome back! The dressing looks delicious. Sounds great I love balsamic vinaigerette. 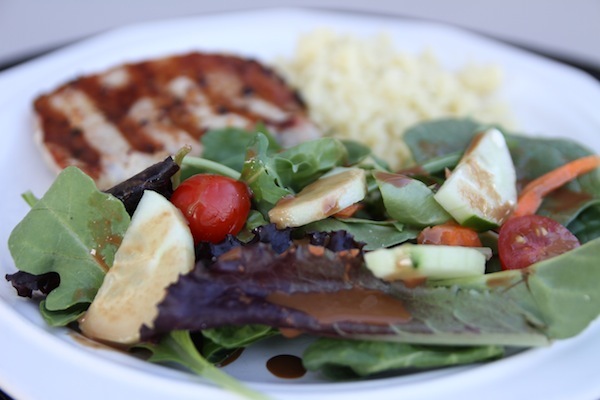 Love anything balsamic vinaigrette! Now how about some yummy zuchinni recipes? LOADS of them but can only make so much bread!